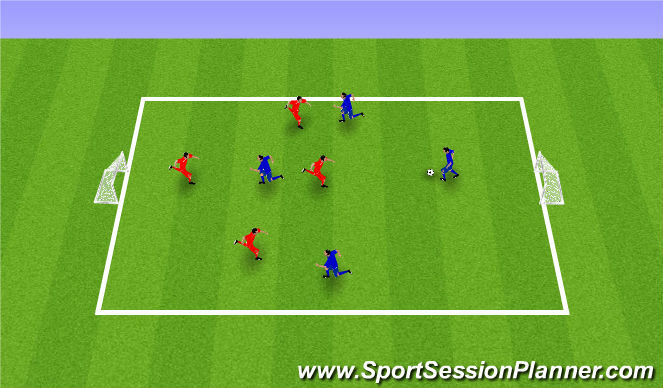 This session is intended to improve our finishing skills. Objective: to activate the players mentally and physically in the Play Practice Play model of training. Organization: set up two goals and an area that will accommodate the total amount of players you believe will be at training. Here it is 8 and the area is 30x40. Instructions: As soon as 2 players have arrived at training start playing. As players arrive add the them into the game. It is free play. 2. Guided discovery is ok during this time but no correcting or commands. Objective: improve our ability to finish by placement. Keeping the ball low and hit with pace. Organization: 12 x 16 grid with a small goal at one end. Instructions: Attacking players starts with the ball and dribbles out. Goes 1v1. Tries to score in goal. 3. Shoot once you see an opening. Objective: Improve speed dribbling and finishing. Organization: two full size goals on 20x24 side field. An 8x5 box in the middle. Instructions: First player on red team dribbles in the box. Blue player starts in the box and backpedals to become the goalkeeper. Red player can shoot from anywhere in the box. As soon as red player shoots she must back backpedal to become goalkeeper. 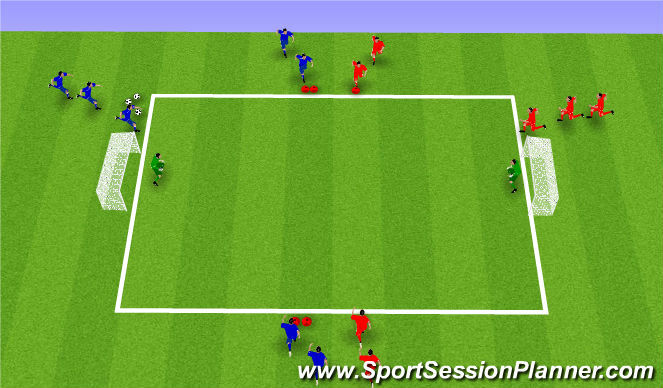 The next blue player in line dribbles out and shoots once inside the box. Variations: (1) right foot only, (2) left foot only, (3) laces only, (4) instep only etc. 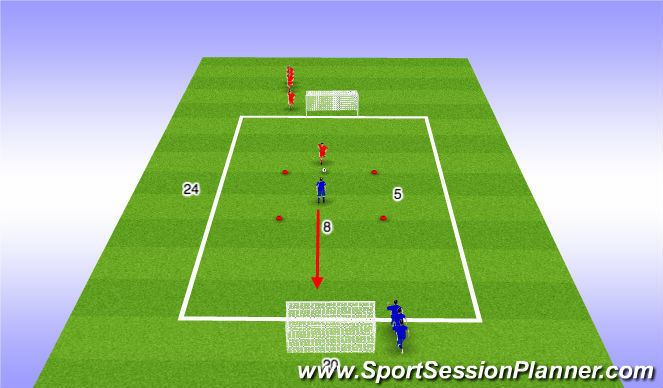 Objective: improve 2v2 and 3v3 attacking. 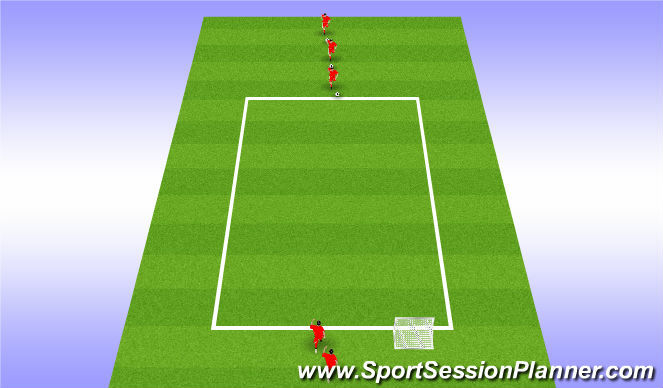 Organization: for 2v2 the players organize on the post. For 3v3 they organize as shown in the graphic. Instructions: coach plays the ball out and teams play 2v2 or 3v3. Whatever end the ball exits is where the ball enters.